Whether you prefer a practice that moves quickly through a sequence, or one that focuses more on stillness, a good yoga session connects you with a deep sense of rhythm. Repeatedly emphasizing that sense of rhythm, soothes and nourishes wind element in the body. According to Ayurveda, wind element (sometimes called air) powers all movements; from the action of your joints to the passage of nutrients through cell walls. You can feel the qualities of wind element in the cold wind of autumn and winter: cold, dry, rough, irregular, unstable (moving) subtle and light. Because wind is movement, it is also power. Undistorted wind element gives you great, unforced capacity for work, great stamina, and enthusiasm for life. The subtle nature of wind element conveys inspiration and creativity. Healthy wind means all movements and cycles in your body occur with regular rhythm and timeliness. There are neither excess movements in the intestines (rumbling, gas and bloating), nor trembling sensations or spasms in the muscles. Sleep comes easily and is undisturbed through the night, and you handle life’s difficulties without anxiety or excess stress. However, the habits of over-doing, multi-tasking and spending long hours in front of a computer can badly disturb wind element, causing anxiety, insomnia, severe depletion, constipation, and joint pain among other complaints. In my last three posts, I offered poses for connecting with earth, water, and fire elements. The sequence below could be used on its own or mixed in with the other postures to create a sequence which awakens earth, water, fire, and wind — invoking a sense of balance between rootedness, transformation, and growth. Starting on your hands and knees with your palms directly under you shoulders and knees beneath hips, inhale and lift your head and tailbone, arching your back. Really plug the base of your first finger and thumb into the floor and pull against the mat slightly with your palms. Exhale and lift the center of your spine towards the ceiling, rounding your back. Bring your forehead towards your pubic bone and draw your navel back towards your spine. Inhale and come back to the arch position. Try to make the length of the breath and movement match up. Continue this movement until your motion is fluid and your spine feels supple and awake. Benefits: This popular posture is great for syncing your breath and movement. It also enhances the circulation of cerebral-spinal fluid and encourages proper movement of the pelvis for forward and back bends. Starting from standing towards the center of your mat, step your right foot just a few inches forward, rooting it down into the earth. Lift your left foot just a tiny bit off the floor. Inhale and lift your arms alongside your head and exhale, hinging forward on the right hip, keeping the torso in line with the left leg. Only come forward as far as you can without lifting the left hip upwards. On the next inhalation, hinge back up to standing, but try not to touch your left foot down to the mat. Exhale hinge forward again. Continue hinging up and down with each breath for 3-5 repetitions. On the last repetition, hold the balance for 5-10 breaths before returning to standing on an inhalation. Benefits: Balance postures in general have a great, rooting effect on wind element if they are practiced with a light heart. That means going easy on yourself if you can’t stick the balance. Falling out of the posture laughing is much more effective than deepening your frown lines as you hold your breath and nail the shape of the pose. Starting from standing, step your feet about shoulder distance apart. Interlace your hands behind your head, at the base of the skull. Inhale, lifting your face and chest and spreading your elbows. The exhalation will come out in 3 parts. Make a “HA!” sound with each part. 1. 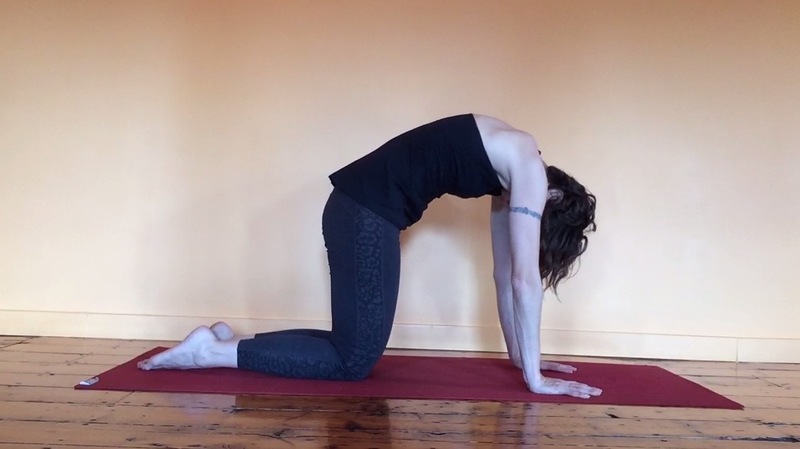 Drop your chest forward, centered between the 2 legs. 2. Bounce slightly, and bring the chest towards the right leg. 3. Bounce again and bring the chest towards the left leg. Inhale deeply as you lift the torso back up to standing. Repeat 4-8 times. Avoid this posture if you have high blood pressure or glaucoma. If you feel dizzy, come to a squat or Child’s Pose until it passes. Also, if you have very tight hamstrings, bend your knees slightly. Benefits: This pose is amazing for releasing tension around your voice, or “speaking your truth.” It also helps to release the weight of grief from the heart and chest. Come down to your mat, lying face-down. Tuck your chin slightly and bring your forehead to the floor without squishing your nose. Interlace your fingers behind the base of your skull and rest your elbows on the floor. Breathe deeply into your belly and relax. Stay here as long as you feel comfortable. Benefits: This variation of Savasana helps to reduce stimulation and quiet the mind. It also causes the inhalation to expand into the lower back, helping to release tension and inflammation there. What are some of the ways you find rhythm and rootedness in your practice? Try these poses out — especially the ones that are new to you — and let us know: can you feel the power in clarified wind element?